It all started at the mother of the bride's house for getting ready. 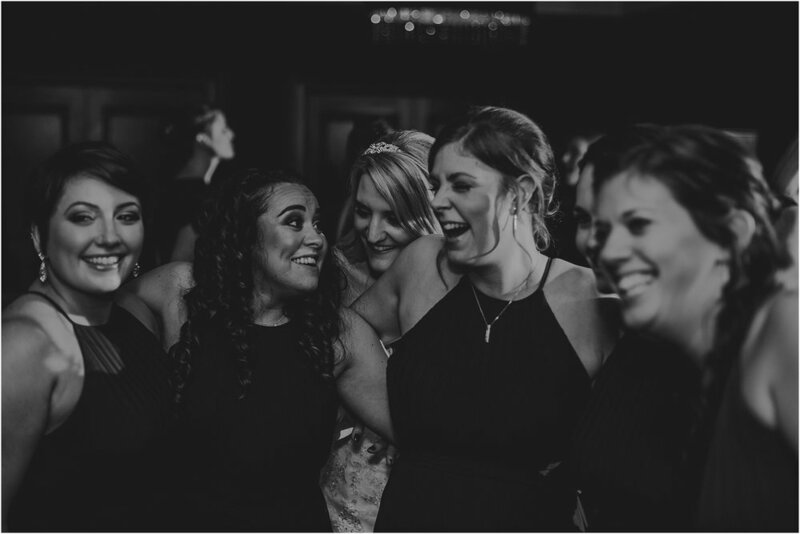 Surrounded by her posse of bridesmaids Janie was transformed into the most beautiful bride. Bridesmaid Heather was on hand for hair duties after Janie was "made up" by Kiss & Make Up. 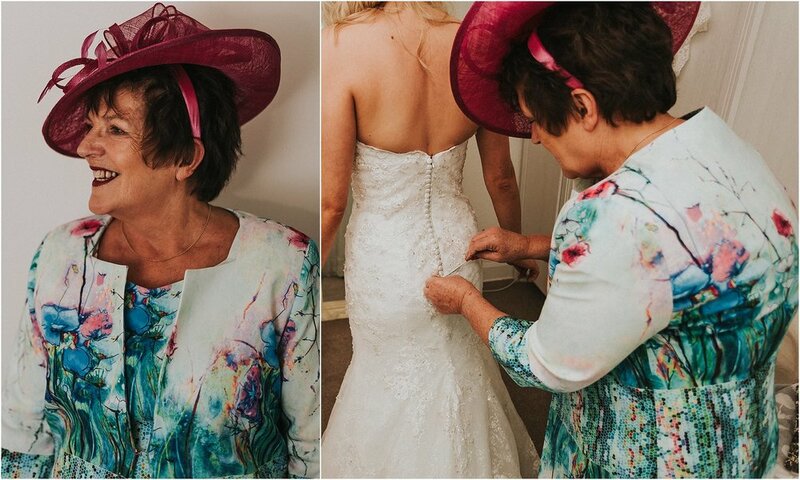 When the time came to get into her dress, Mum was on hand to help out and a special moment was shared. 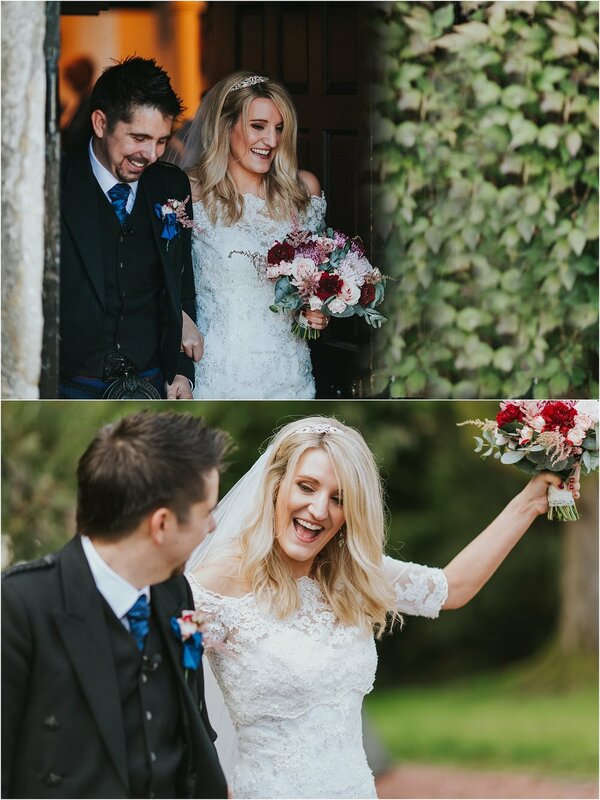 With a gorgeous lace dress and shawl combo from Ivory Pinks, Janie looked every bit the stunning bride I had pictured she would. And clearly her bridesmaids agreed, judging by their gasps as she walked in to unveil her finished ensemble to them. 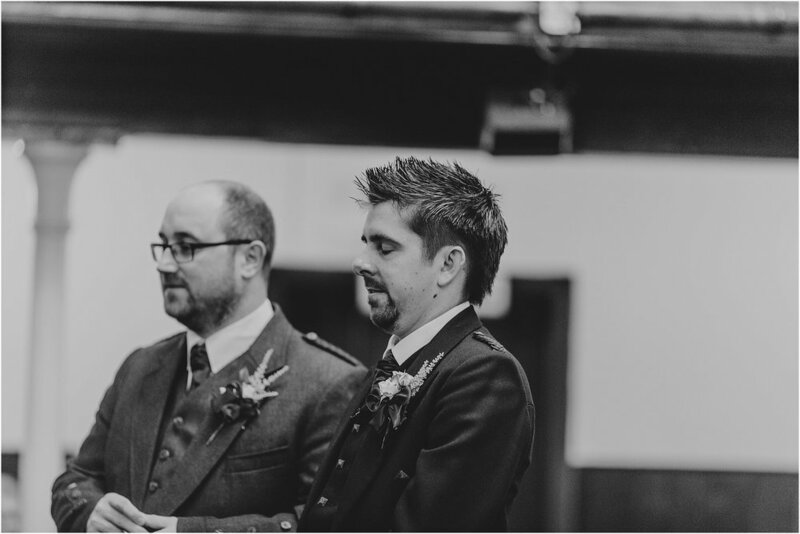 The ceremony took place at Carmunnock Parish Church, a building built in 1767. As in, before America even existed as a country! 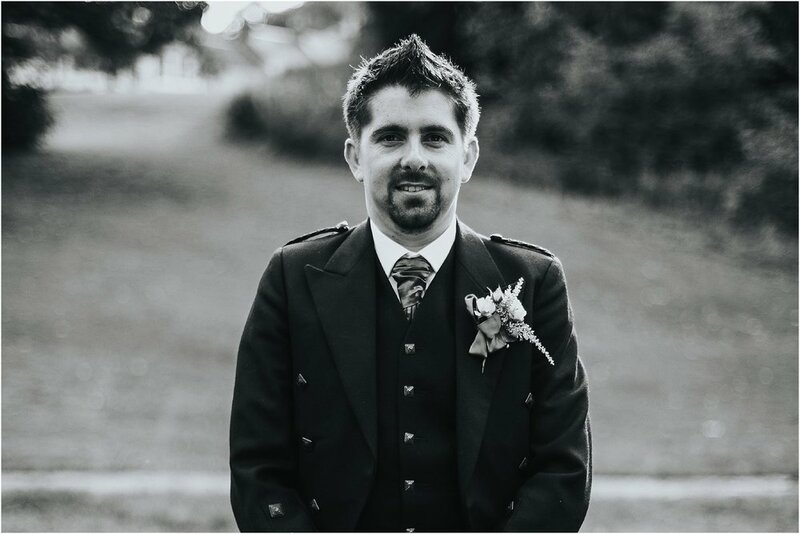 I quickly popped in to say hello to Garry, who was looking dashing in his kilt but clearly feeling the nerves. 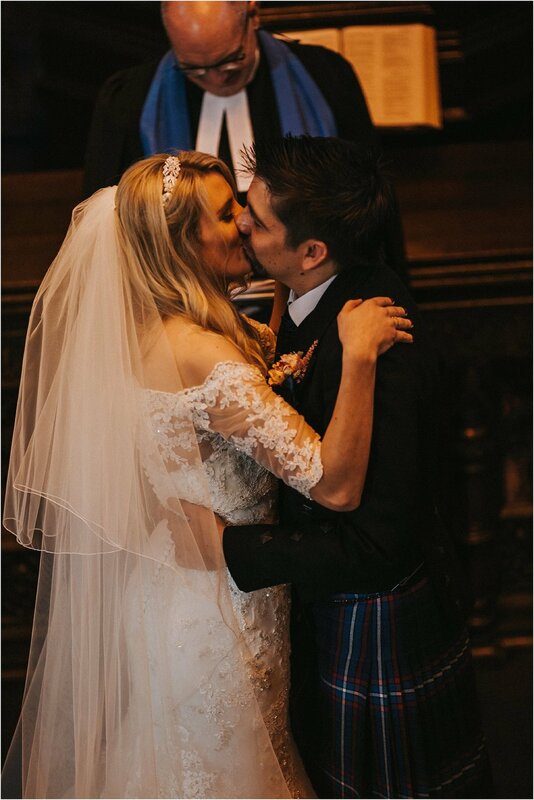 Those nerves disappeared however when Janie walked down the aisle and took her place by his side. After a couple hymns, a reading and a blessing, I Do's were exchanged and Janie & Garry were husband and wife! For the family portraits we decided to stay at the church but headed outside to get the beautiful stonework and greenery of the building. With that out of the way we headed to the Eglington Arms where the reception was to be held. 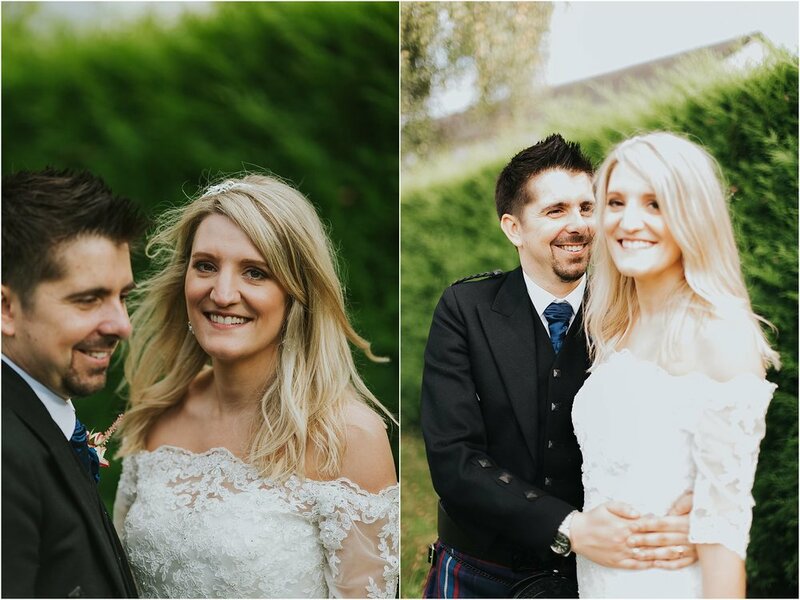 Before I let them head in and meet their guests though, I had to pull them outside for some couple portraits. These are always my favourite part of the day and these two didn't disappoint. Clearly smitten I eventually gave up trying to get them to look at me and just let them look at each other. 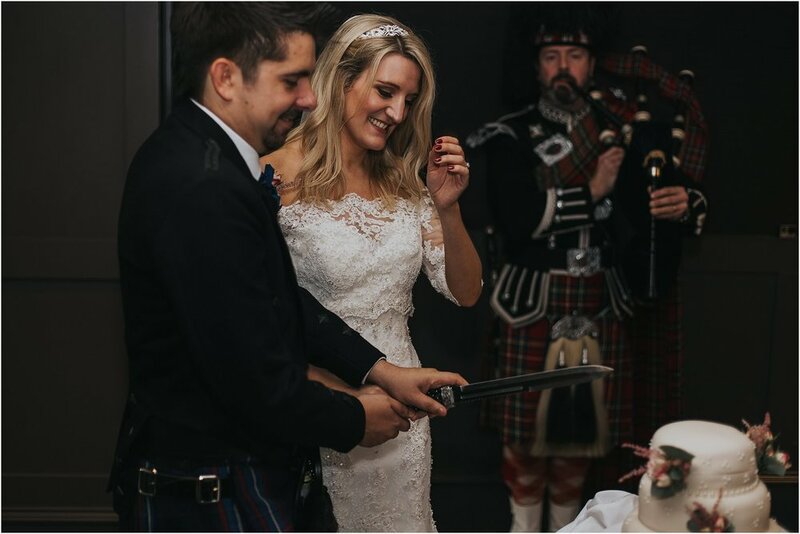 One of the differences in UK vs US weddings is that in the UK the toasts and cake cutting come BEFORE the meal, not after. I'm not sure why, but I imagine it probably has something to do with alcohol.....anyway! The delicious cake came first. Made by family friend (and former coffee customer of mine back in the day) Carolyn it was simple and elegant and I'm not ashamed to say I had a rather large piece after the fact and it was scrumptious! Janie & Garry have a lot of people who love them so there were a lot of toasts and they were as varied as the people who gave them. Funny, poignant, cheeky, but all beautiful and even the bride herself got up and had some words to say. While the couple and their guests chowed down I grabbed their rings and went to do another of my favourite things, detail and ring shots! 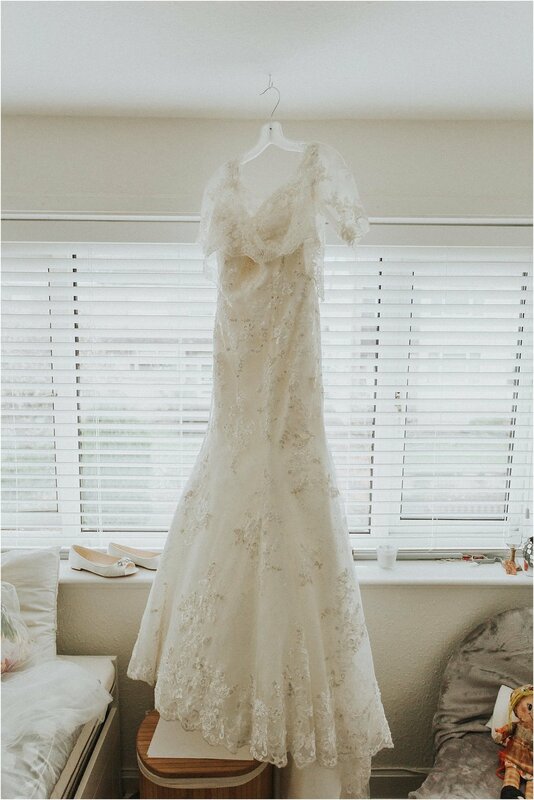 It's the details that help bring a wedding together and these two had thought of everything. From the Disney themed table names to the gin/whisky bottle candles/lights on the tables, everything was them to a t. And just look at the beautiful rings! 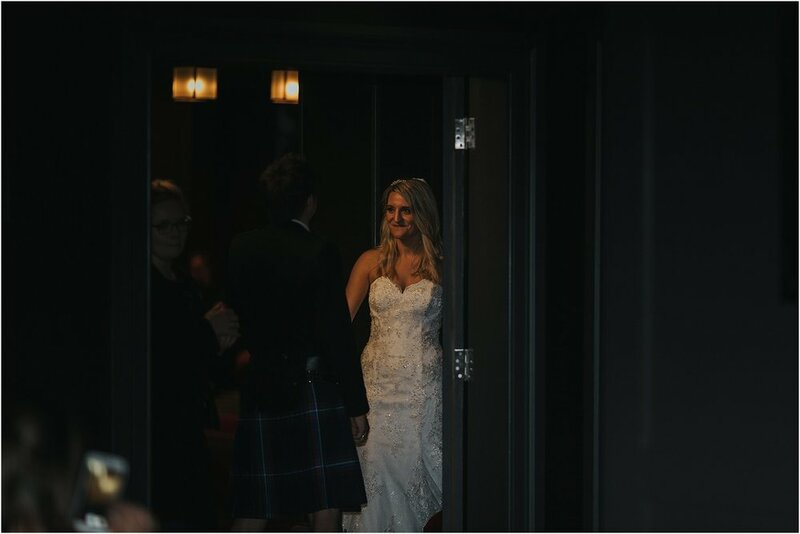 After grabbing some nosh myself I headed back in to capture the first dance. Set to 'When The Right One Comes Along' they swayed and swirled while their loved ones looked on, and then they all joined them! Once that song finished the party really started, Velvet Five kept the hits coming one after another. Before everyone got too tired though I grabbed the bride & groom and their wedding party and we headed outside to have some fun with sparklers. 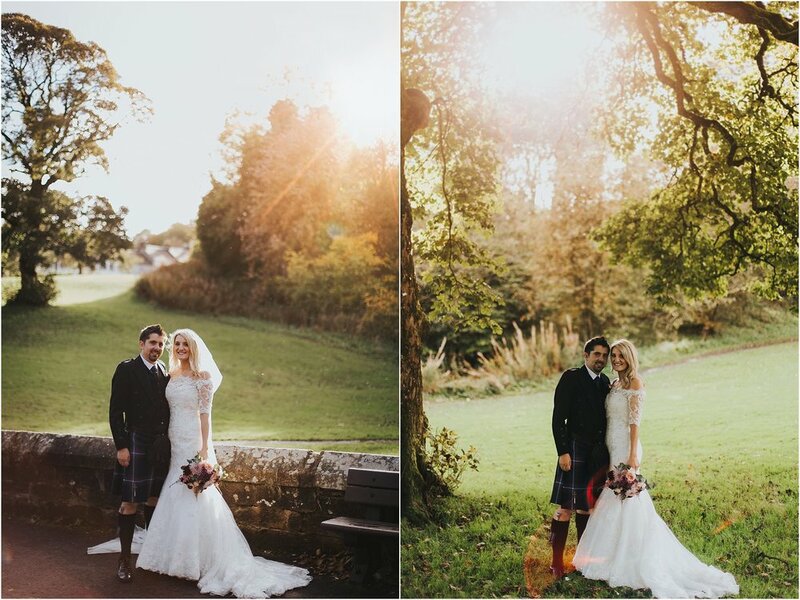 It was the perfect send off to a perfect day! Newer PostAndréa + Downtown Seattle = Magic! Older PostWhat a difference a year makes.